Location: The southeastern region of Eriador, adjacent to the Mountains of Moria; marked on the north by the Hollin Ridge, and bounded on the east by the Misty Mountains, on the south by the Glanduin ('Border-river') and on the northwest by the River Mitheithel (Hoarwell). The travellers reached a low ridge crowned with ancient holly-trees whose grey-green trunks seemed to have been built out of the very stone of the hills. Their dark leaves shone and their berries glowed red in the light of the rising sun. Map of the central section of the Misty Mountains, showing Eregion (Hollin). ... Gimli... was gazing out before him with a strange light in his deep eyes. 'There is the land where our fathers worked of old, and we have wrought the image of those mountains into many works...: Baraz, Zirak, Shathûr. '[Under] them lies Khazad-dûm, the Dwarrowdelf, that is now called the Black Pit, Moria in the Elvish tongue. Yonder stands Barazinbar, the Redhorn, cruel Caradhras; and beyond him are Silvertine and Cloudyhead: Celebdil the White, and Fanuidhol the Grey, that we call Zirakzigil and Bundushathûr. [They] struck a good path. It looked to Frodo like the remains of an ancient road, that had once been broad and well planned, from Hollin to the mountain-pass.... Many of [the stones] looked to have been worked by hands, though now they lay tumbled and ruinous in a bleak, barren land. They reached the strip of dry land between the lake and the cliffs.... A mile southwards along the shore they came upon holly trees. Stumps and dead boughs were rotting in the shallows, the remains it seemed of old thickets, or of a hedge that had once lined the road across the drowned valley. But close under the cliff there stood, still strong and living, two tall trees, larger than any trees of holly that Frodo had ever seen or imagined. Their great roots spread from the wall to the water. Under the looming cliffs they had looked like mere bushes, when seen far off...; but now they towered overhead, stiff, dark, and silent, throwing deep night-shadows about their feet, standing like sentinel pillars at the end of the road. Next day they went on into northern Dunland.... [They] rode [northward] at ease until they reached the Swanfleet river, 2 and found the old ford, east of the falls where it went down suddenly into the lowlands. Far to the west in a haze lay the meres and eyots through which it wound its way to the Greyflood: there countless swans housed in a land of reeds. So they passed into Eregion.... [Looking] from their camp on a low hill the travellers saw away in the east the Sun catching three peaks that thrust up into the sky through floating clouds: Caradhras, Celebdil, and Fanuidhol. They were near to the Gates of Moria. 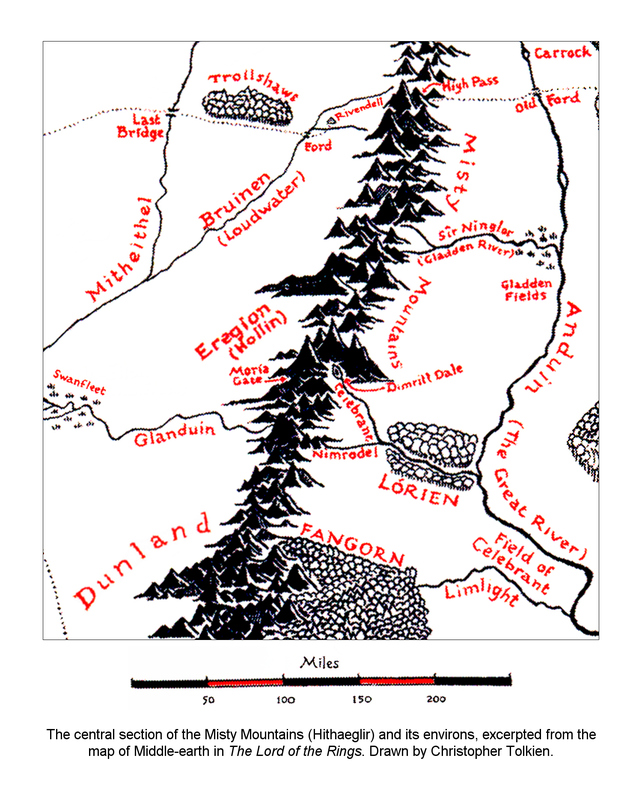 [Some] of the Noldor went to Eregion, upon the west of West-gate of Moria. This they did because they learned that mithril had been discovered in Moria. The Noldor were great craftsmen and less unfriendly to the Dwarves than the Sindar; but the friendship that grew up between the people of Durin and the Elven-smiths of Eregion was the closest that there has ever been between the two races. Celebrimbor was lord of Eregion 3 and the greatest of their craftsmen; he was descended from Fëanor. [Elrond] told of the Elven-smiths of Eregion and their friendship with Moria, and their eagerness for knowledge, by which Sauron ensnared them. For in that time he was not yet evil to behold, and they received his aid and grew mighty in craft, whereas he learned all their secrets, and betrayed them, and forged secretly in the Mountain of Fire the One Ring to be their master. But Celebrimbor was aware of him, and hid the Three which he had made; and there was war, and the land was laid waste, and the gate of Moria was shut. 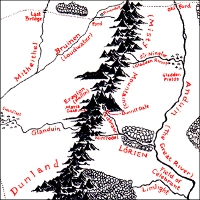 2 In The Return of the King VI 6 [the Glanduin] is called the Swanfleet river (not River), simply as being the river that went down into the Nîn-in-Eilph, 'the Waterlands of the Swans'. 3 A sketchy alternative version of the tale states that Celeborn and Galadriel established Eregion and ruled there until a rebellion in Second Age 1350 by the Gwaith-i-Mírdain, the Elven-smiths' guild; only then did Celebrimbor become lord of the land.